Every year Harrogate Convention Centre fills with musicians young and old for The Christmas Event in Harrogate. Approximately 300 primary school children join forces with Harrogate Choral Society and Harrogate Symphony Orchestra in this concert. Every year there are three teams of children and there are so many schools in the district that each school will only perform at once every three years so this is a really special event for them. 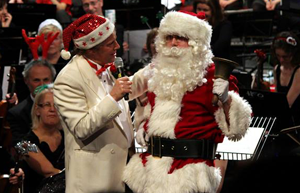 There are also special guests  the ladies choir Beati, and of course not forgetting the most important man of all at that time of year who we hope will be there in his red suit! For wheelchair spaces please call 01423 502116 to book. A £1.75 transaction fee will be added at the end of your order. Order from as many shows as you like in one transaction and pay just £1.75.